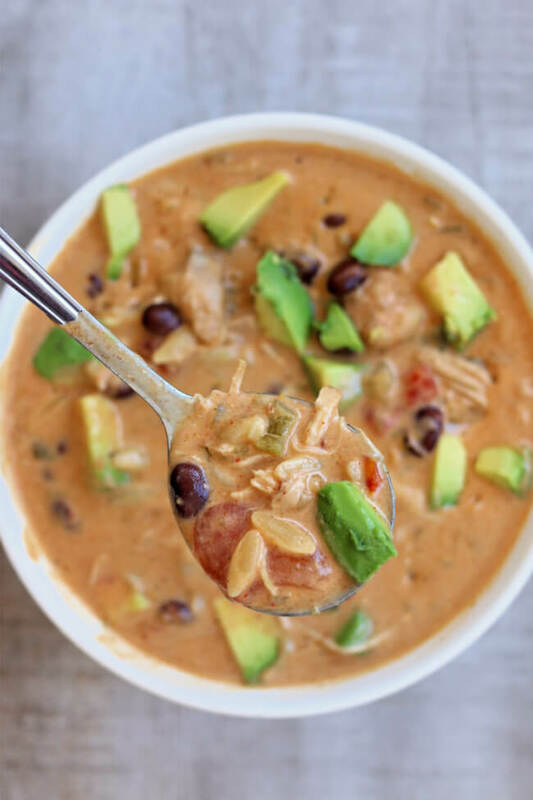 Instant Pot Green Chile Chicken Orzo Soup–a creamy chicken soup with orzo and green chiles. It’s got cream cheese and avocados for creaminess and lots of flavor from diced green chiles and salsa verde. An easy dump and go recipe. To make Instant Pot Green Chile Chicken Orzo Soup I used my 6 quart Instant Pot Duo 60 7 in 1*. I love this Instant Pot because it has the yogurt making function which I use almost weekly. It has two pressure settings (high and low), and there are also little slots in the handles so that you can rest the lid there instead of putting it down on your counter-top. 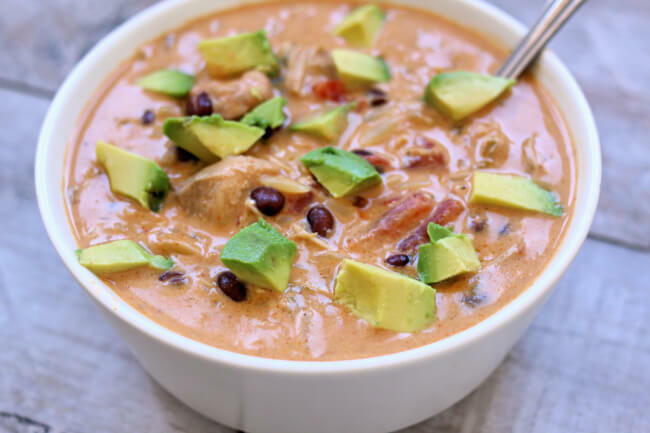 You can also make this soup in the 8 quart Instant Pot with no changes. You can halve this recipe and make it in the 3 quart pot. Keep the same cooking time. Set the cream cheese on the counter so that it can come to room temperature. Add broth, salsa verde, black beans, chicken, green chiles, tomatoes, chili powder, cumin and smoked paprika to the Instant Pot. Cover the pot and secure the lid. Make sure valve is set to sealing. Set the soup button (or manual/pressure cook button) to 10 minutes for chicken breasts and 12 minutes for chicken thighs. When the time is up let the pot sit for 10 minutes and then move the valve to venting and remove the lid. Add in the cream cheese and the uncooked orzo (see note) and set the pot to the saute setting. Use the adjust button to adjust the saute setting to “less.” Let the orzo cook and the cream cheese melt for about 5 minutes, stirring every minute. Shred the chicken or cut it into bite size pieces and add it back into the pot. I used my 6 quart Instant Pot Duo 60 7 in 1*. 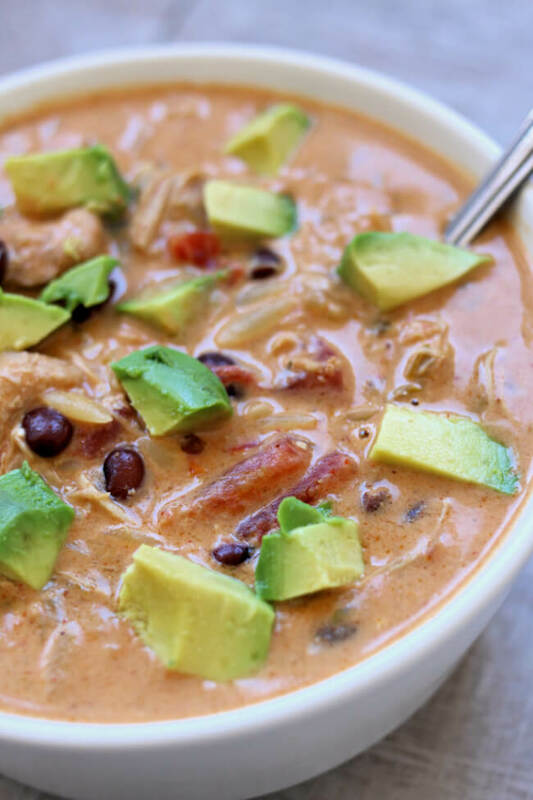 You can also make this soup in the 8 quart Instant Pot with no changes. You can halve this recipe and make it in the 3 quart pot. Keep the same cooking time. Gluten free option: to make this soup gluten free leave out the orzo. You could substitute the orzo with cooked rice. I haven’t tried it yet but think it would also work to add a half cup of uncooked rice into the pot and let it pressure cook. 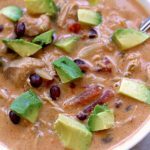 Like this recipe for Instant Pot Green Chile Chicken Orzo Soup? Get all my new recipes delivered to your email inbox by signing up below. This soup is AMAZING! I just added a bit of cayenne like I do to almost everything and I have to admit that it was difficult to talk myself out of getting seconds, My husband was impressed as well. Thank you so much for coming up with such good meals. Thanks Rhonda! I’m so glad you liked it! If I use frozen chicken breasts, do I need to adjust the cook time? It should be fine with the stated times. The pot will just take more time to come to pressure. This was very delicious. I added some red and yellow peppers, a little bit of red quoina that I had and some sirirachi sauce. I topped it with some cilantro and a few tortilla chips. Yumm! We just got about 6 inches of heavy wet snow. Seems like I spent the whole day shoveling. Wondered what I was going to make for dinner and saw this recipe. I had everything I needed in the house–BONUS!! Just ate a bowl full and OMG it is SO GOOD! The flavor is amazing. It has a nice little kick but doesn’t make your throat burn. The house smells wonderful as a bonus. Another winner at my house Karen. Thank you so much. Absolutely love your website and share with all my friends who have Instant Pots. Oh wow! that’s a lot of snow! Where are you at? I am about an hour south of Milwaukee Wisconsin. Darn. The orzo didn’t cook in the 5 min on saute, nor did the cream cheese melt. The flavor is good, though.